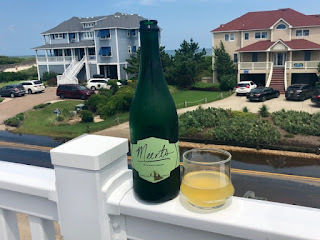 It's New Brew Friday and today we're celebrating at the shores of North Carolina with a delightful beverage from Wisconsin's Funk Factory Geuzeria, the Kiwi Melon Meerts. This gueuze pours a bright yellow with lots of fizzy bubbles up top and aromas of fresh melon, lemon rind and funk. The flavor is tart kiwi up front with a strong acidity that smooths out with more funk and soft melon tones in the finish. Clocking in at just 4.5 % this fruity, refreshing Meerts is the perfect beverage for sipping in the sun on a steamy summer day. Cheers to New Brew Friday!